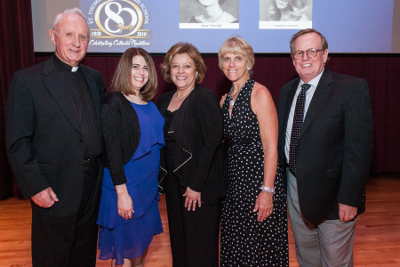 The leadership team of STA has dedicated a combined 139 years of professional service to the STA community. Under the direction of Supervising Principal Monsignor Vincent Kelly, STA aims to “break the mold” and stay on the cutting edge as the ideal Catholic school. In her 36th year at STA, Dr. Denise Aloma, Principal, emanates an exceptional passion for education as she leads STA's pursuit of academic excellence. Dr. Robert Mulder, Dr. Suzy Prieto, and Mrs. Margie Scott serve on the team of Assistant Principals. Dr. Mulder shares his expertise in curriculum and academic development; Dr. Prieto, '92, integrates educational technology in the classrooms and through teacher training; and Mrs. Scott leads the tremendous force of Student Activities and Community Relations.